There’s a plaque inside the Horniman Circle Gardens that tells you about its history. The gardens have a community centre, a reading corner for students, a performance centre in the form of a raised plinth, a children’s corner and a partial underground toilet, all of which are open to all. Patrick Campbell Baird from Ayre, North Britain, was a Fellow of the Royal College Of Physicians of Edinburgh and a Superintendent Surgeon in Guzzerat (Gujarat). He served his employers for 24 years before succumbing to the harsh climate of Surat. A cherubic angel in flowing garb watches over his marble memorial that sits snugly between ornate urns and horses navigating stormy seas. Patrick Campbell Baird is in august company. Memorials honouring military heroes and former Governors of Bombay line up the walls of St. Thomas Cathedral, the first stop in my “Town Trinity”. Crisp winter afternoons or balmy summer evenings at Horniman Circle usually begin at the city’s oldest British-built building and first Anglican Church. Eyes transfixed on the white and yellow gothic tower, I walk past the grand marble fountain and into the cool confines of the 298-year old cathedral. Elaborate stained glass panels create the illusion of Victorian England. The bearded patron saint stands tall – Bible in hand – flanked by his golden-haired archangels. Soft, pearly light diffuses through oyster-shell windows; the long-stemmed ceiling fans sound a steady whirring rhythm, punctuated only by occasional honks – a harsh reminder of the proximity to Mumbai’s madding crowd. But I want to stay a little longer. So, it seems, do the others in the hallowed hall – an aged, bespectacled gentleman deep in prayer and a suited professional deep in sleep, hunched forward, head resting comfortably on his daily planner. Sleepers and snorers find solace at the next stop as well – they can be found scattered all over Horniman Circle Garden. The wooden benches are a favourite. Most prefer to lie flat in the dead corpse pose (shavasana), head cushioned by a suitcase or the morning newspaper. A few like more complicated yoga poses – arms hugging the backrest, legs flung over the wrought iron armrests, head bobbing precariously. But that’s much too tame for the daring souls who’d rather sleep sideways along the fountain parapet, their closed eyes shutting out views of the modern black iron structure and the green water underneath. I remember noticing the fountain the first time I walked into the Horniman Circle Gardens during the Kala Ghoda Festival. Eighteen years old, enthusiastic and theatre-crazy, I'd braved the throngs to grab good seats for Alyque Padamsee's The P Dialogues. Halfway through the performance, I’d lost all interest in the dialogues. Here I was sitting in the front row, and all I could think about was exploring this little oasis enclosed in wrought iron, surrounded by the most elegant buildings I had ever seen. 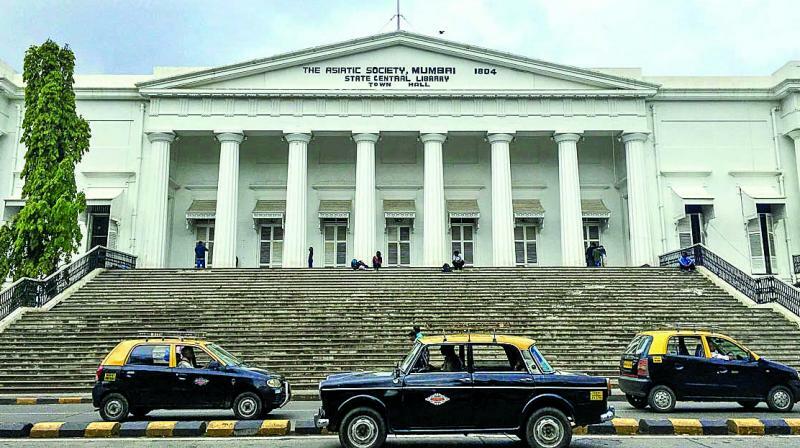 I don't remember much about the play, but since then Horniman Circle has become my patch of green in the city – much like Hyde Park in London and Roath Park in Cardiff. Stepping away from the children’s play area (usually used by college boys as a makeshift gym), I glance at the more studious lot settled at picnic tables, poring over a dozen textbooks. Once dusk falls, bulbs will light up their eager faces, and they will continue studying late into the night. All except the podgy kid in a blue school uniform. He will continue playing Candy Crush on his phone. If the great banyan tree where the Bombay Stock Exchange has its roots doesn’t inspire him, only one other place can: the Asiatic Library. Home to over 1,00,000 books – including one of only two original copies of Dante Aligheri’s Divine Comedy – the library is a sanctuary for the city’s book-lovers. Before you get to the ceiling-high shelves lined with yellowed map scrolls and the cushy green chairs, you have to walk up the wide stairs to the Town Hall. The stairs are iconic, and not just because of their appearance in Hindi films and television serials. Early morning joggers stop here to do a few hundred lunges. Stray dogs bask here in the afternoon sun. Friends hang out here, exchanging notes and gossip after college ends. Lovers sit with their arms intertwined beneath the milky moonlight. I like to explore beyond the Town Trinity. I like to wander past the bright Red Mumbai Samachar office, wave to the ever-smiling owner of Royal Stationery Mart before having chai at New India Tea House. I like buying 15 rupee poetry books at Strand, watching the suitcase-fixer work his charm on a 30-year-old bag and admiring the life-size weighing scales at A.S. Porbunderwala Hardware Stores. But when I’m weary after cavorting, my feet automatically turn back towards Horniman Circle. If there’s any rest for the wicked, it’s here – in the city’s circle of green.